Almost all of my greeting cards were made using paper quilling techniques. Although I'm not good at other techniques of scrapbooking, I always enjoy creating handmade greeting cards for friends and family on holidays and special occasions. I have also noticed that people usually prefer unique gifts like handmade cards even if they are not perfectly made. 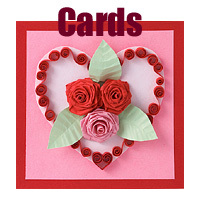 Please use the cards label to find ideas, tutorials and inspiration for greeting cards on my blog. You might also find the list below more convenient to use, it contains links to my cardmaking-related posts, organized by categories.